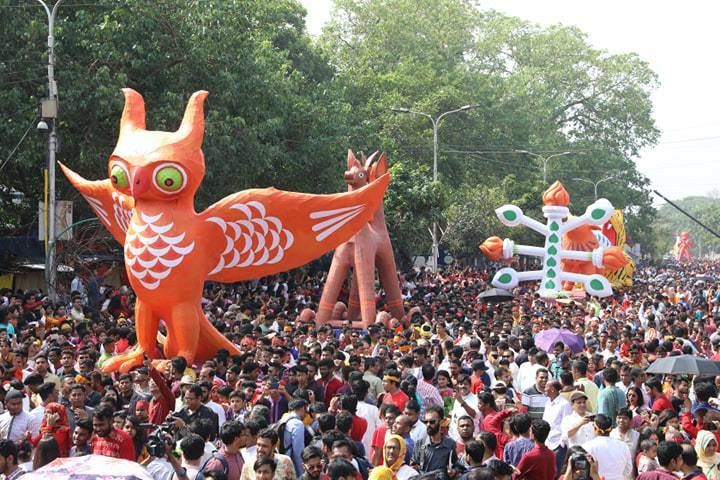 The Mongol Shobhajatra – a colourful procession featuring large masks, animal-shaped life sized carnival floats and other motifs of Bangladeshi culture, on the first day of Bangla year by students and teachers of Faculty of Fine Arts of Dhaka University has become an integral part of Bangali culture. But if someone think that Mongol Shobhajatra began long ago, he/she is wrong. Mongol Shobhajatra was the brain child of three students of Dhaka Fine Arts Institute, now the Faculty of Fine Arts at the Dhaka University – Mahabub Jamal Shamim, Moklesur Rahman and Heronmay Chanda. Inspired by a similar procession that had taken place in Jessore in 1985, the trio along with their classmates and friends first brought out the procession in 1989, which over the years spread countrywide and became an integral part of Bangali culture. Since then, the DU Fine Arts Faculty has been organising Mongol Shobhajatra every year in Dhaka, which is attended by not only the students and teachers of the university, but also thousands of people from all walks of life. The decision was made at the 11th session of the Inter-governmental Committee on Safeguarding Intangible Cultural Heritage held in Addis Ababa, Ethiopia on November 30, 2016.